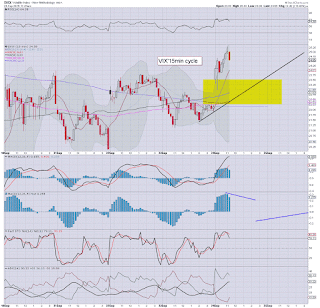 With equities closing somewhat weak, the VIX was back on the rise, settling +6.1% @ 23.47 (intra high 25.30). 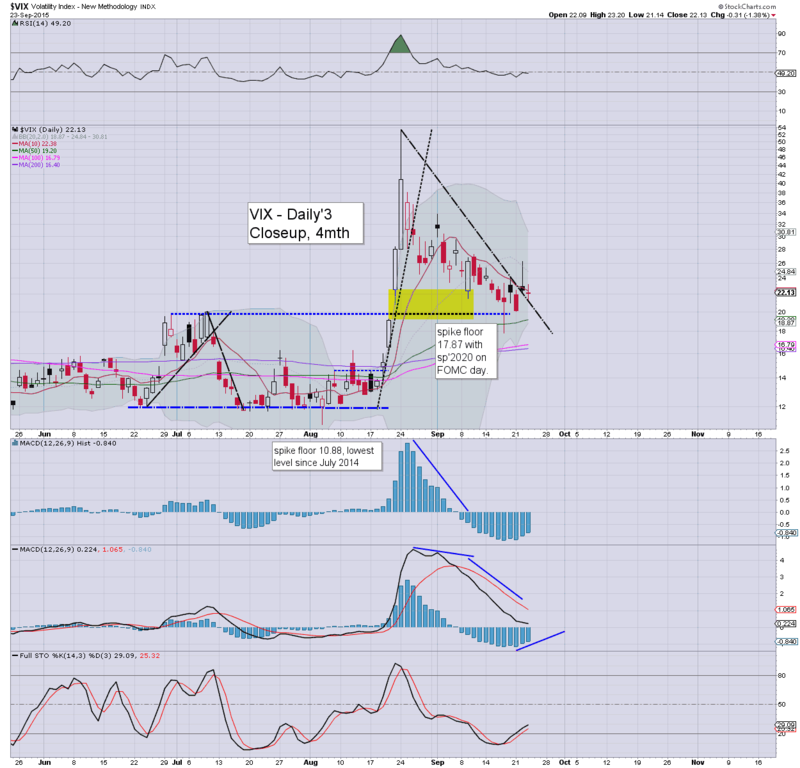 Near term outlook is for continued equity weakness, with the VIX on track for the 30 threshold. If sp'1820.. then VIX is likely to spike to the 40/45 zone. 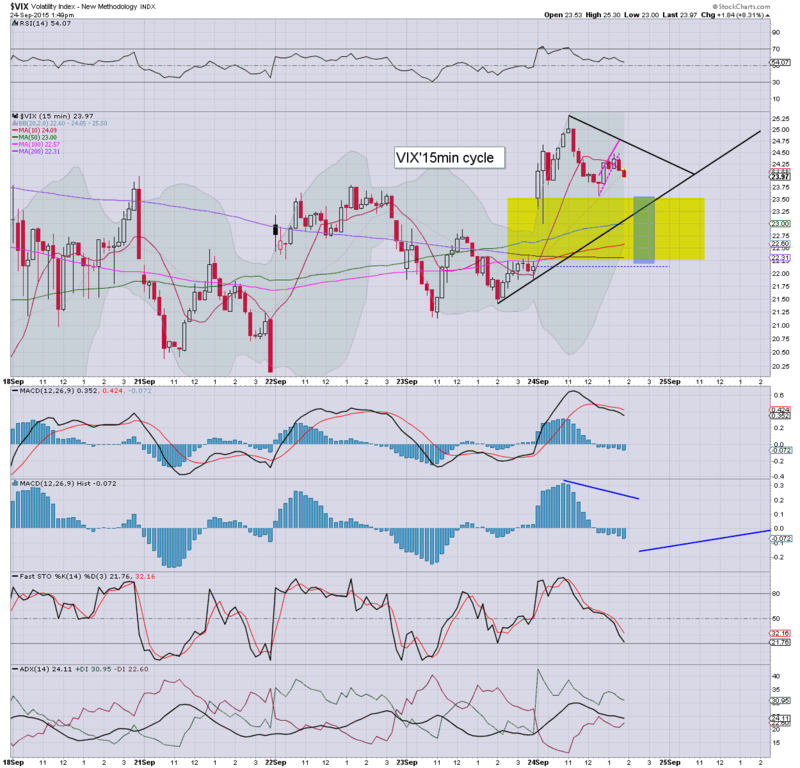 *a notable green candle on the 'rainbow' daily chart. 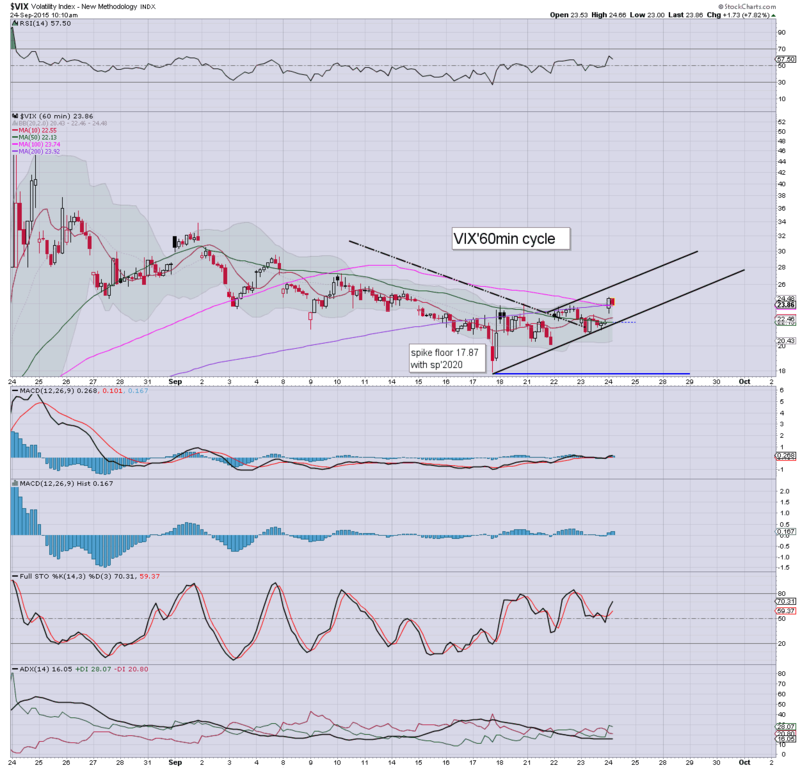 Suffice to say.. VIX is very likely beginning a new up wave. First target is the 30 threshold.. and then the 40/45 zone... the latter would certainly require a break of the sp'1867 floor though. *I am holding long VIX from the 23s. 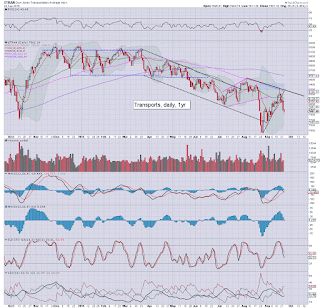 US equity indexes closed weak, sp -6pts @ 1932 (intra range 1908/37). The two leaders - Trans/R2K, settled lower by -1.0% and -0.2% respectively. 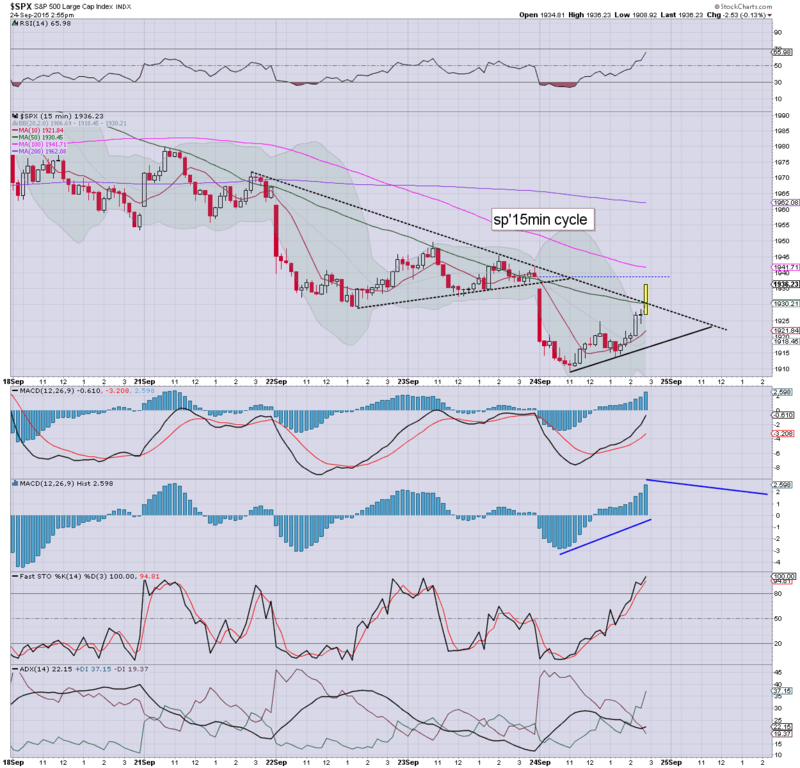 Near term outlook is for continued equity downside.. to test the 1900 threshold... and break through to 1820 by next Thurs/Friday. 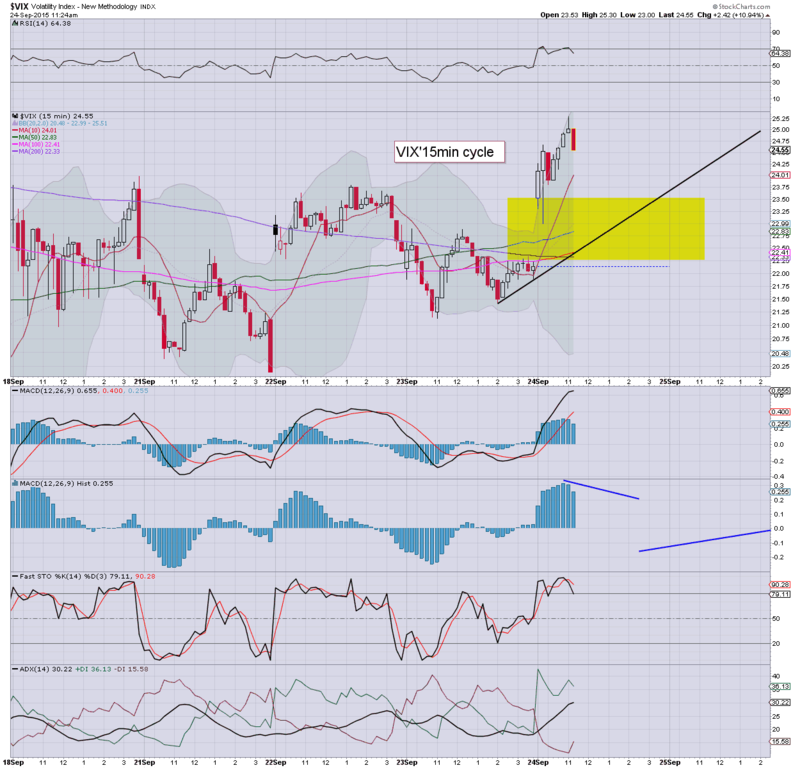 *closing hour: pretty wild action as the market tried to break a new high.. but was firmly stuck at 1937. ..and another day at the worlds most twisted and stomach churning casino comes to a close. 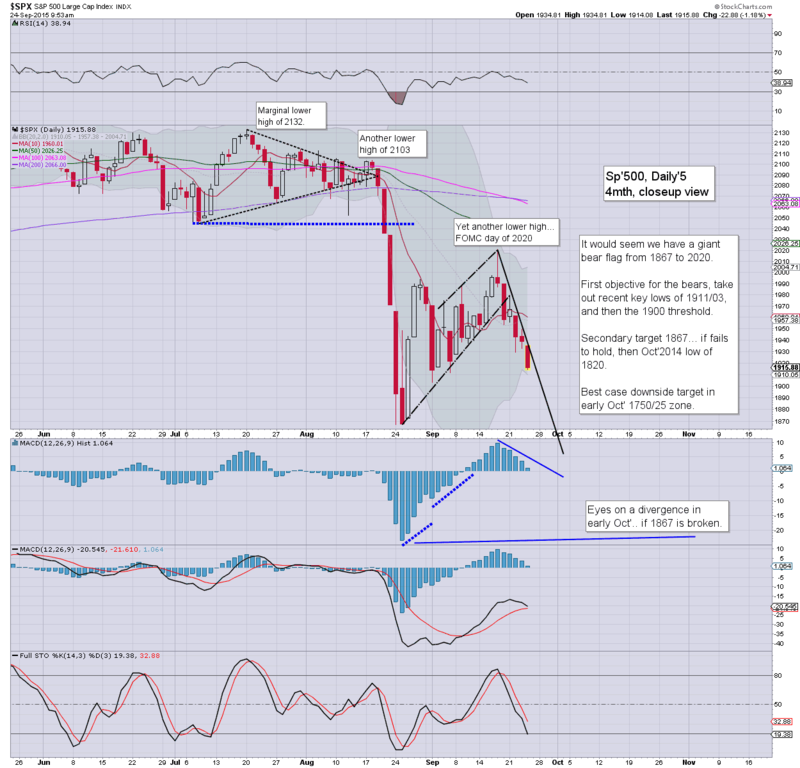 All things considered, a day for the bears... with a lower low of sp'1908.. and VIX having broken to the 25s. *I hold VIX-long and SPY-short overnight... but having dropped AAPL/INTC- both short this morning, I am only half short what I was. US equities have managed to claw to an afternoon high of sp'1937... with VIX cooling to the 22s. 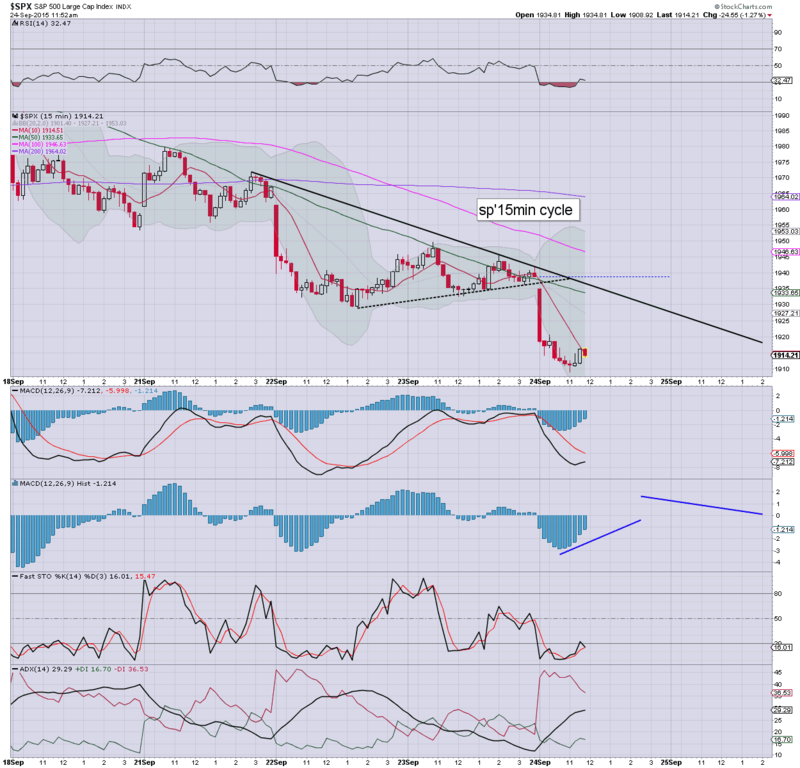 The micro 5/15min cycles are arguably now maxed out, and some degree of renewed downside looks probable into the close. *I picked up two positions at 2.30pm... VIX-long... SPY-short.. from sp'1927.... and will hold overnight. 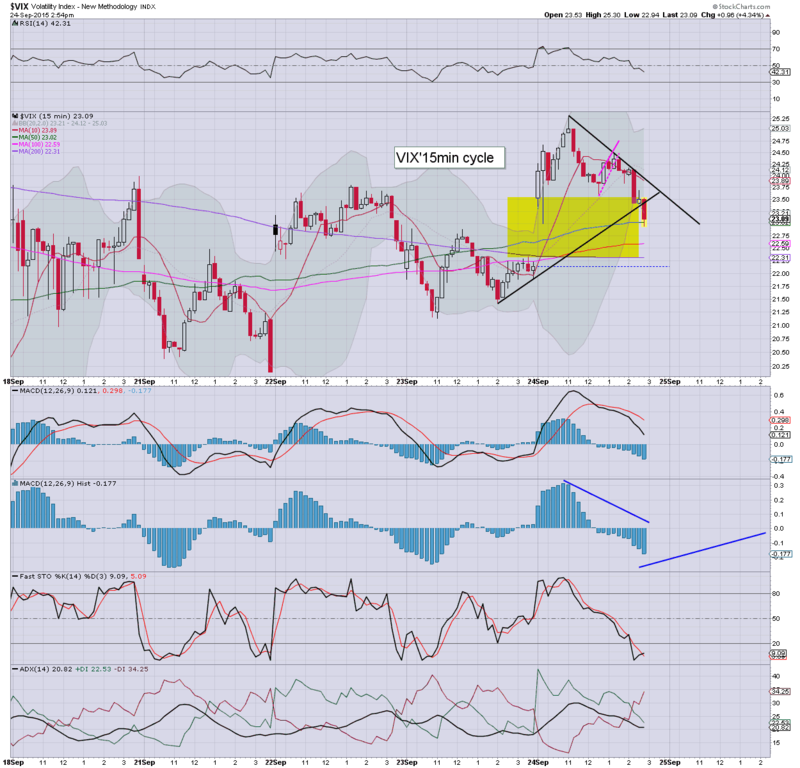 So.. lets see if the market wants to trade lower into the close.. ahead of the Yellen. For the wave counters out there.. the price structure from 11am to 3pm is a rather classic ABC/123 retrace.. as also reflected in the VIX. 3.20pm.. Market is getting real twitchy this moment.. VIX is flipping around the 23 threshold. The micro 5/15min cycles remains VERY HIGH.. and are due to cycle lower into the close.. and into tomorrow morning. 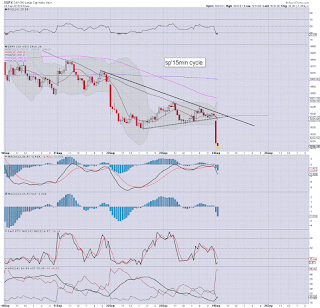 US equities remain broadly weak... after what has been a rather weak bounce. The bigger weekly charts remain absolutely clear... the market was decisively broken in August.. and recent price action is not remotely like the V shaped recovery of Oct'2014. 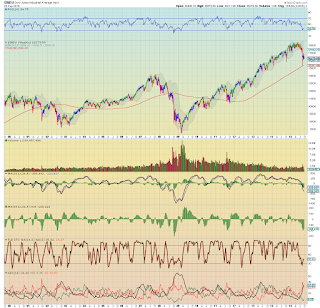 Sub sp'1900s.. and to 1820 looks highly probable... within days. *I remain on standby to pick up a VIX-long and possibly also SPY-short block.. this hour. 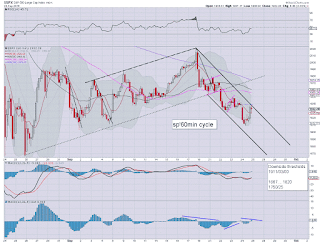 I've eyes on the micro 15/5min cycles... prime time for a bounce peak will be around 2.30pm. 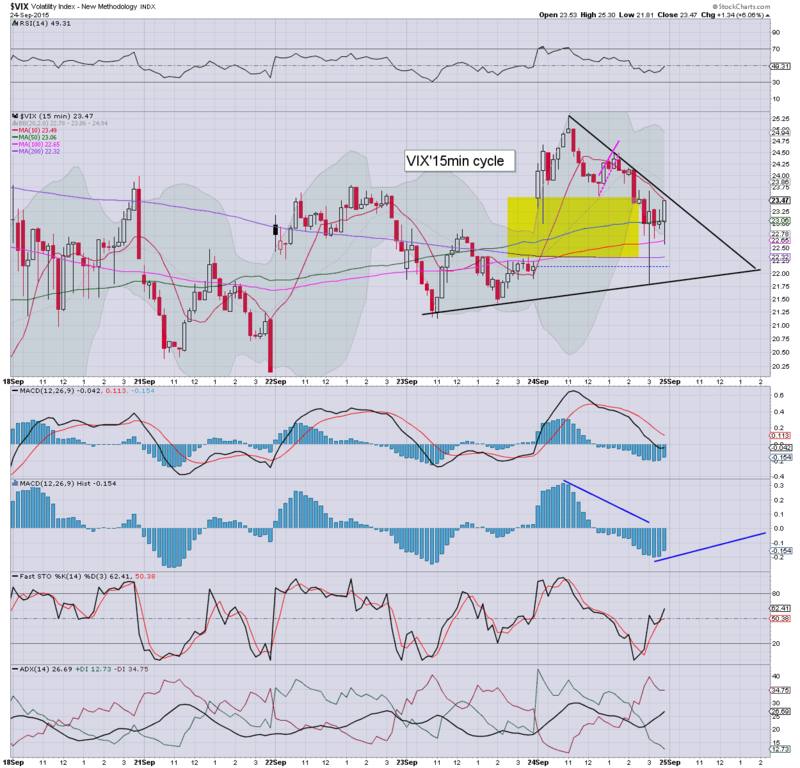 Yellen is due at 5pm EST.. but if sp'1925/30... I'm not particularly concerned. 2.17pm.. We're getting real close to maxing out... well, I think so anything. 2.20pm.. sp'1923.... pushing the limit now... I will be surprised if we go much higher. US equities have continued to claw higher from the early low of sp'1908 (VIX 25.30). 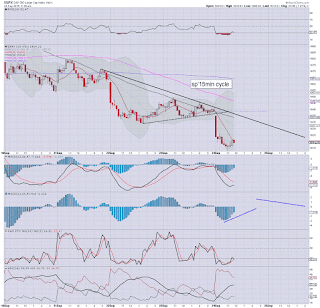 Broader price action and structure is increasingly bearish with each day.. and there remains high threat of renewed downside later this afternoon. *I am standby for a VIX-long.. and SPY-short. Well, I'm kinda tired... and I suppose I could sit it out.. not least with the Yellen this afternoon at 5pm (coverage live on Bloomberg). .. but considering the broader trend, I'd like to at least pick up something short.. before the close. US equities appear to have seen a morning floor (naturally around 11am) of sp'1908 (with VIX 15.30). 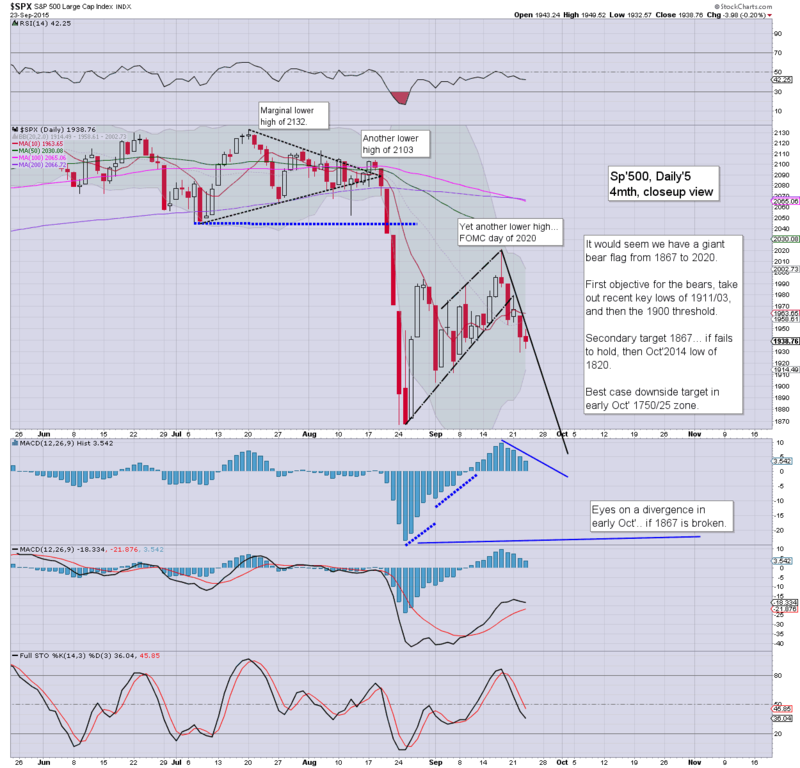 A bounce into the 2pm hour appears underway.. with viable upside to 1920/25. 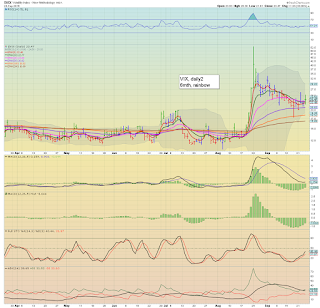 with VIX 23.50/23.00. 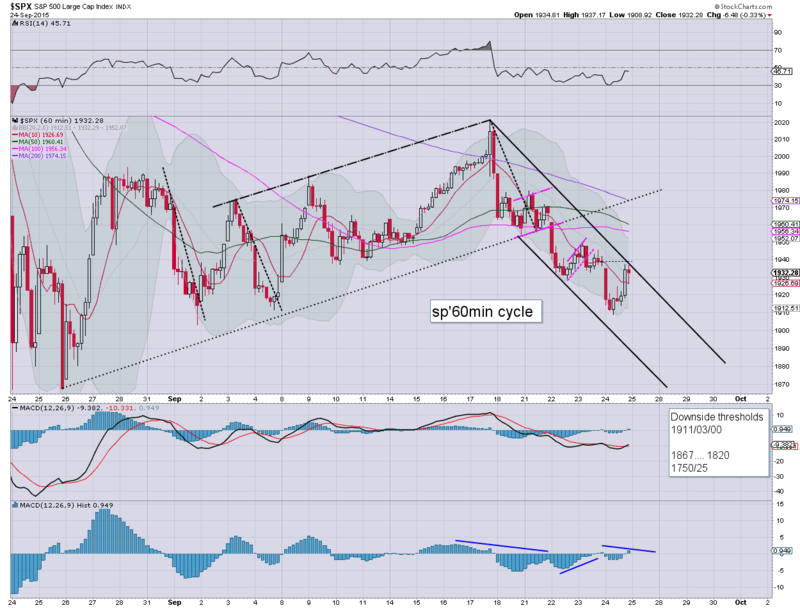 Daily cycles are offering sub' 1900s, with VIX 30 by the Friday close. *I exited VIX-long and AAPL-short in the 11am hour.... I'm now fully on the sidelines. Note the turn at 11am... it does often happen! Lets see if the market can claw back upward into the 2pm hour. Yellen remains a threat to anyone holding short overnight.. but broadly... 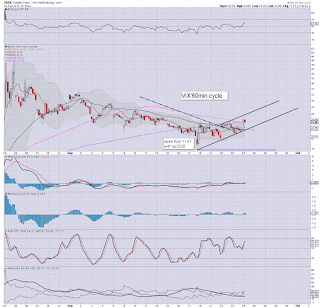 I would have little concern for a re-short from the sp'1920s.. with VIX 23s. US equities remain very weak, a daily close in the 1905/1890 zone remains probable.. along with VIX 27s. 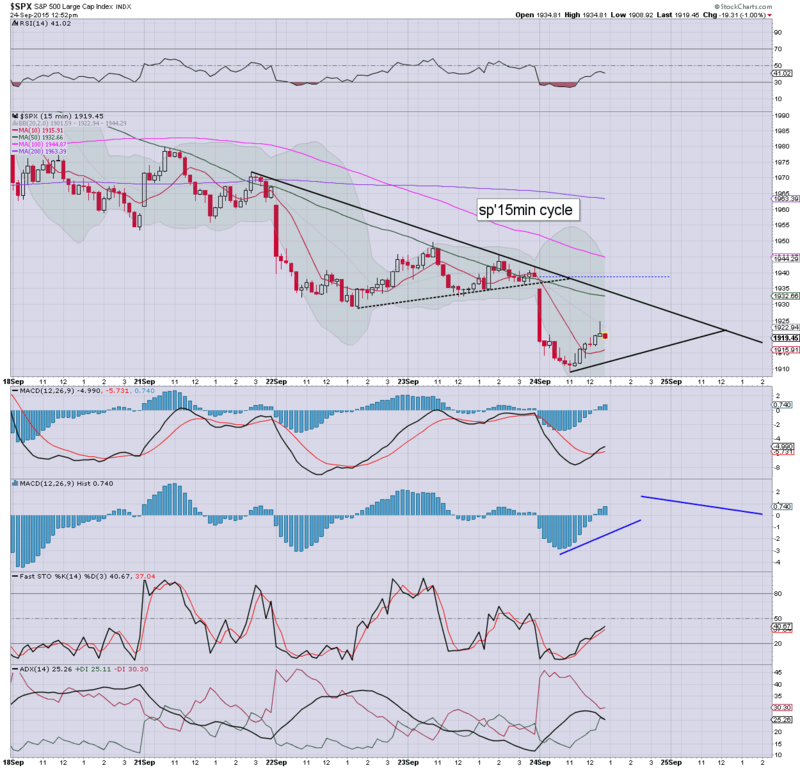 With Yellen set to speak at 5pm EST.. there is threat of an opening Friday gain.. but based on the current trend/pattern.. any such gains won't last. Broader target remains 1867.. and then 1820 by end month. *note the green candle on the VIX 'rainbow' chart... with open air to the upper bol' of 29/30 by late Friday. Increasingly, more will be recognising we're headed for 1900.. and lower. 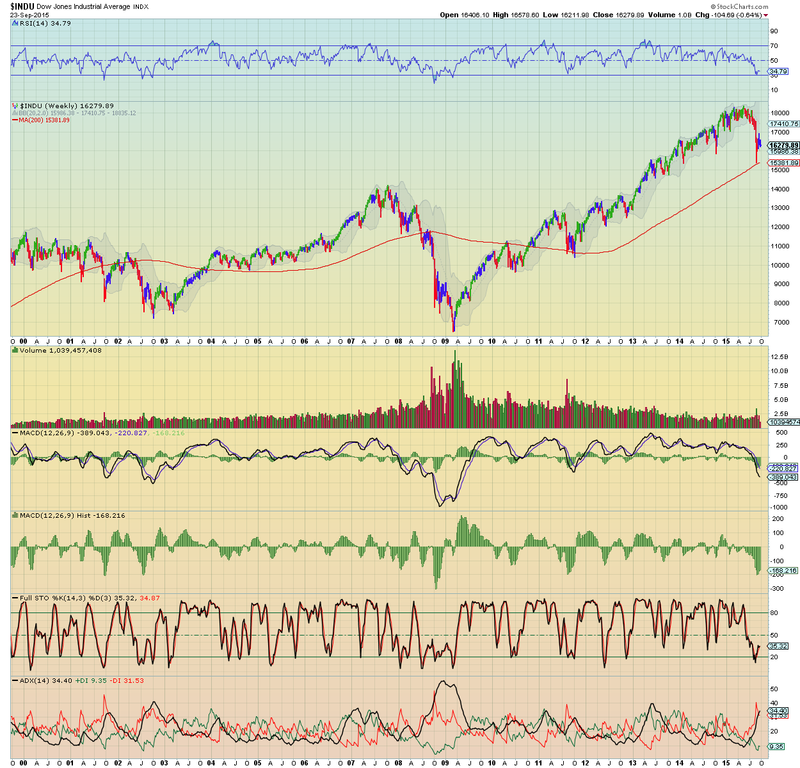 For now.. there is no panic.. but if 1867 is lost... yeah.. then things get interesting. ... and that leaves me with just AAPL-short. 11.15am.. EXITED AAPL-short from 112.65. 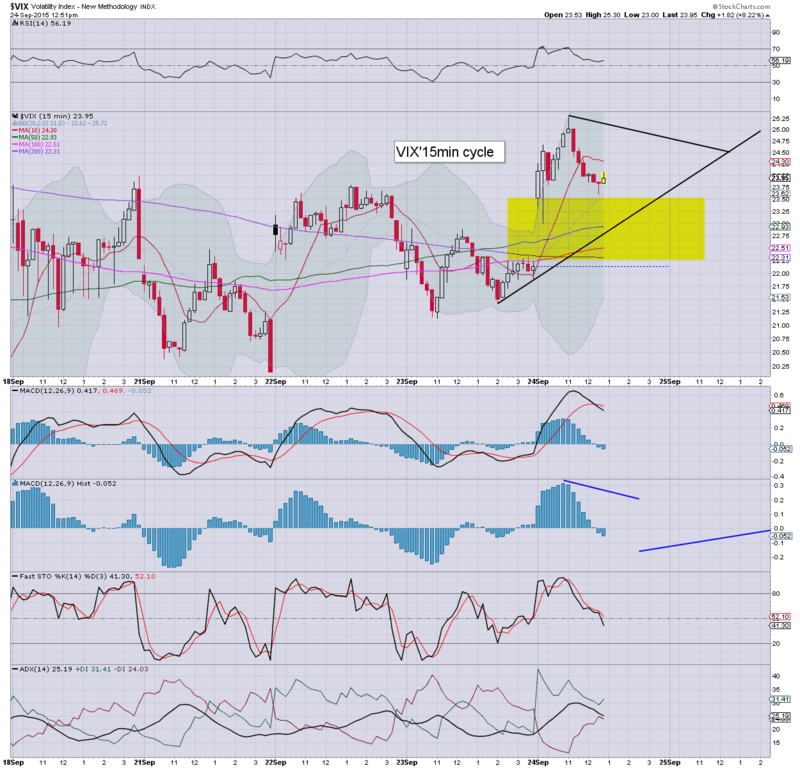 Target retrace.. 23.50/23.00.. 22s look out of range. 11.28am.. VIX rapidly cooling.. 24.40s... with sp'1913. sp'1925 would probably give 23.50 by 1pm.. and I'll strongly consider that. 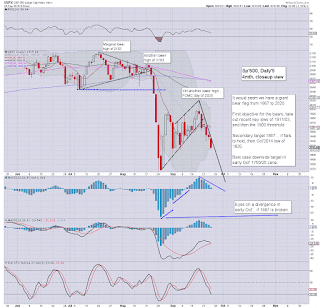 US equities open weak.. and continue to unravel. There is some soft support in the 1915/10 zone. There is threat of minor bounce into the afternoon (as usual)... with the Yellen appearing... offering a brief opening Friday gain... regardless.. broader trend is clear. *bear with me.. I am adjusting trading stops! EXITED INTC-short, SPY-short. from sp'1915. So.. opening weakness... nothing too exciting... but it continues the broader trend. *I am holding AAPL-short... VIX-long... both are still a touch underwater (my entrys were not so great).. but I can stomach holding them across any intraday bounce. If I can drop AAPL by 11am for a minor gain... I shall. 10.07am... HUGE TV event of course.. as the Pope addresses US congress .. at the rather bizarrely early time of 10am. Equities remain in melt down mode.. sp -20pts @ 1918.... a floor around 11am does look probable. 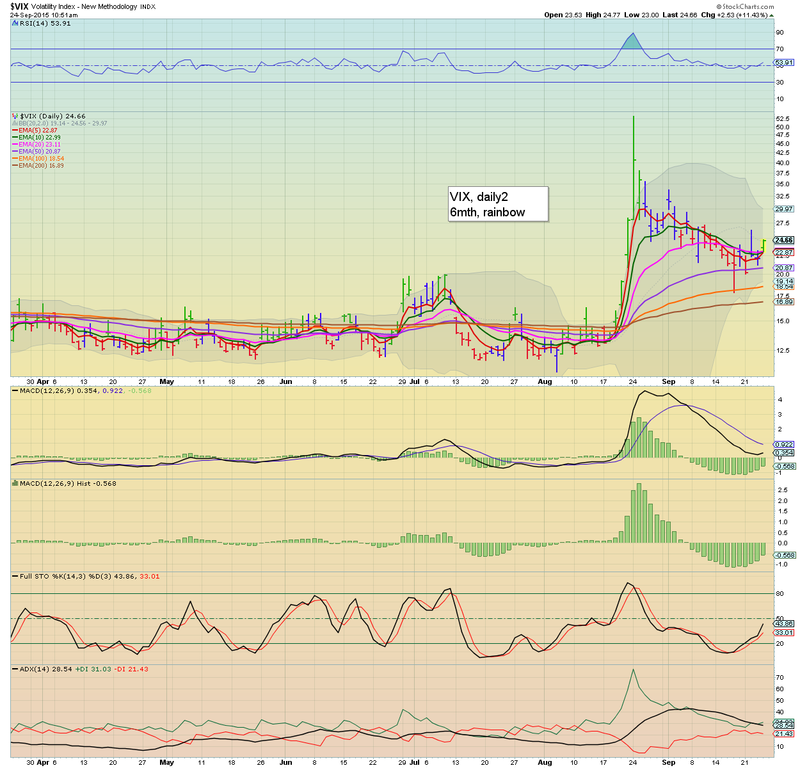 10.11am.. a Solid opening candle for the VIX. 10.25am.. So.. 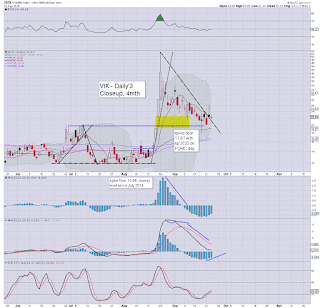 I've eyes on the VIX, hourly charts offer 27s today... with 28/30 by the Friday close. I remain LONG-VIX.. and SHORT-AAPL. *I will consider a SPY re-short.. on any 'nonsense' bounce. whether this afternoon.. or early tomorrow. 10.34am.. a little chop... market trying to hold soft support around 1915... but really... another wave lower to 1905/00 looks probable today. notable weakness: INTC -2.8%... but I dropped that one earlier. Good morning. US equity futures are starting to unravel, sp -13pts, we're set to open at 1925. The door is opening to a test of the 1900 threshold today. 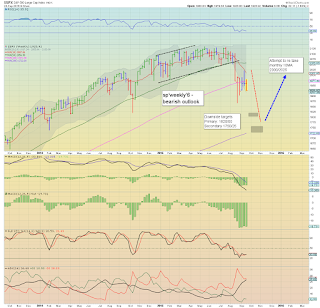 Further downside to 1867... and 1820 looks probable next week. *I strongly suggest anyone watch the Oscar video I highlighted in the previous post. I realise many of you can't stand the overly loud Mr C.. but he makes MANY of the points I am standing by. The implications are important. So... we're set to open lower... and cyclically.. everything is setup in favour to the equity bears. Daily equity MACD cycle could see a bearish cross today.. with the VIX seeing a bullish cross. Both offer a further FULL week to the equity bears. 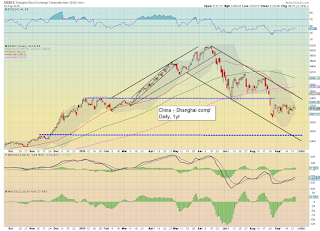 China: +0.9% @ 3142... vain attempt to hold together... it won't last. Sub 3K is due. 7.21am.. sp -18pts, 1920.. things are starting to get significant. Lets see how low the market can fall by around 11am. I would prefer to drop a few positions by late morning, and re-position in the afternoon. However, there is HIGH threat we'll just fall across the entire day. 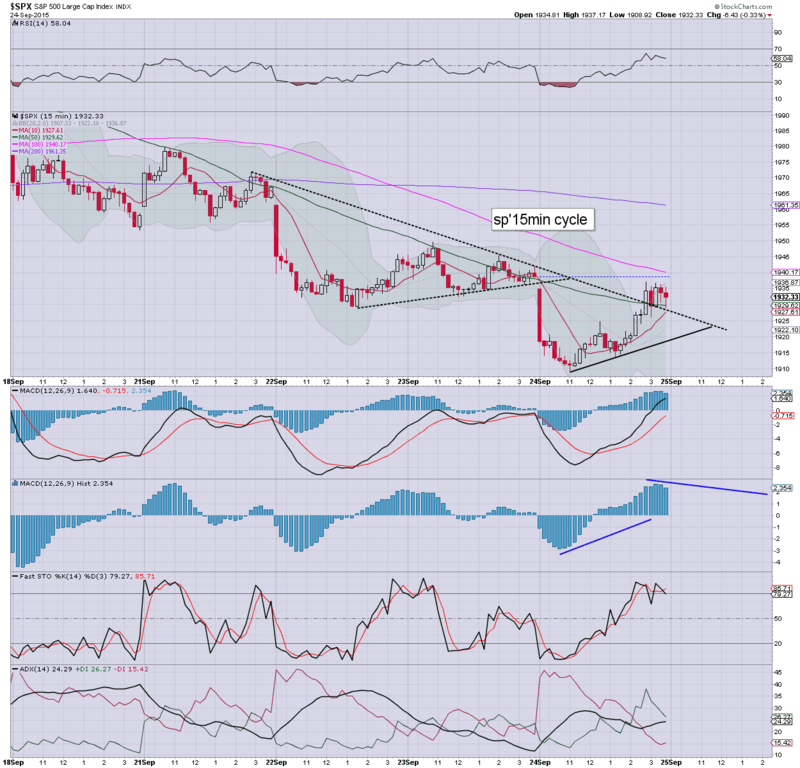 *I am concerned of a possible intraday floor around 11am... somewhere around sp'1915/10...which should equate to VIX 25/26. 9.13am.. sp -16pts... 1922.... viable downside to 1915/10 by 11am... with VIX 25/26s. Yellen is due at 5pm EST.. and yes.. that might be an issue for the Friday open. 9.27am.. Eyes sharp.. on the 5/15min cycles this morning.... along opening VIX action. .. and that is a rather bearish signal for next week. 9.45am.. EXITED INTC-short... minor gain. Whilst the US indexes saw a rather choppy and dull trading day, there was some interesting weakness in the Chinese market. 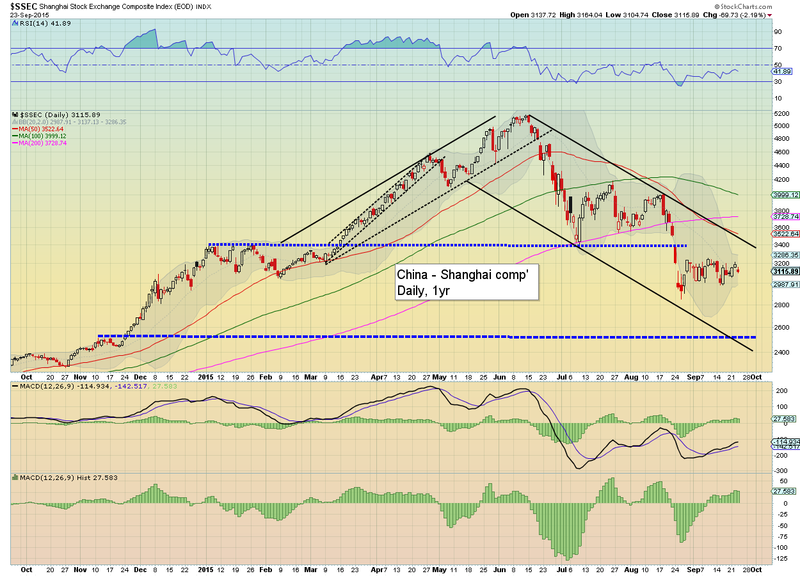 The Shanghai comp' settled -2.2% @ 3115. Price structure across the last few weeks is a clear bear flag, with viable downside to the 2500/2000 zone in October. All things considered.. the SSEC looks set for sub 3000 within days.... and then we should see another down wave... much like August. I sure am seeing a lot of bullish talk in the last few days.. which I'm finding pretty bizarre. Either this market is building a rather strange floor, or it is simply the case that many are losing sight of the bigger picture. 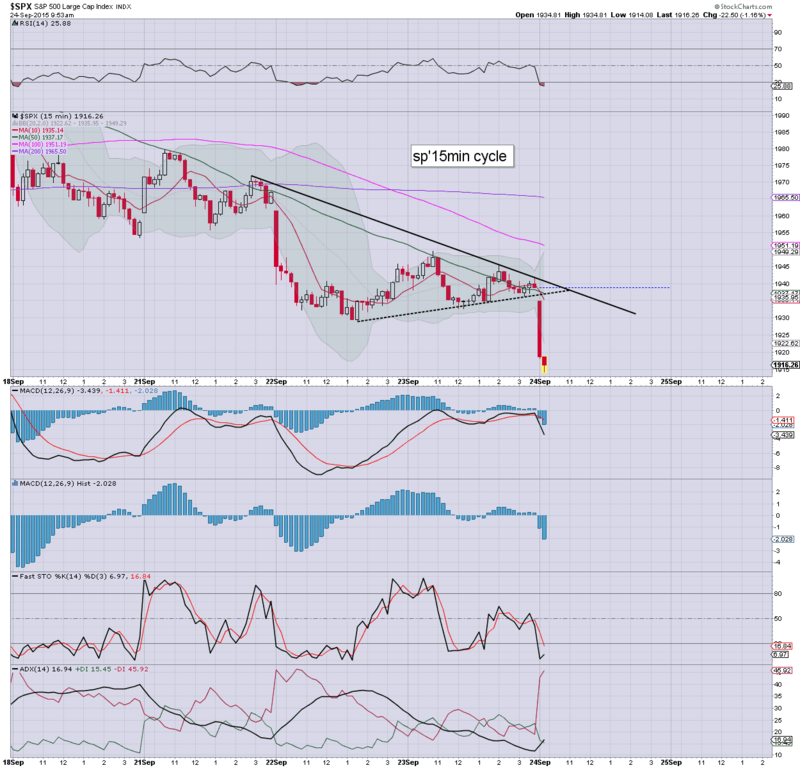 Price structure was a bear flag.. which was broken last Friday. Why would anyone want to be going long mere days after such a key break? *I would look for the weekly 'rainbow' candle to turn red by Friday.. if sp'1900 or lower, which would offer clarity for next week... and into end month. 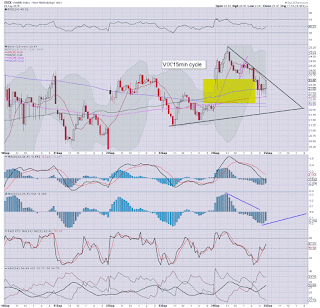 *Yellen is due to speak at 5pm EST... and Mr Market will be very closely listening. Highly recommended. Please note, there are a few brief audio drops. I would imagine there is a high chance of taking out the 200wma in the next down wave... by mid Oct.
Perhaps the most bearish video I've ever seen from Oscar, and makes a number of points that I've also made lately. So.. a moderately negative day for equities.. but really, it wasn't great for yours truly... underwater in 4 of 4 positions, although it will only take one sig' down day to turn things around to a very profitable situation. I would certainly prefer to close out 2-3 positions into the coming weekend. Broadly though, I am pretty confident we'll see the sp'1900 threshold tested by late Friday. 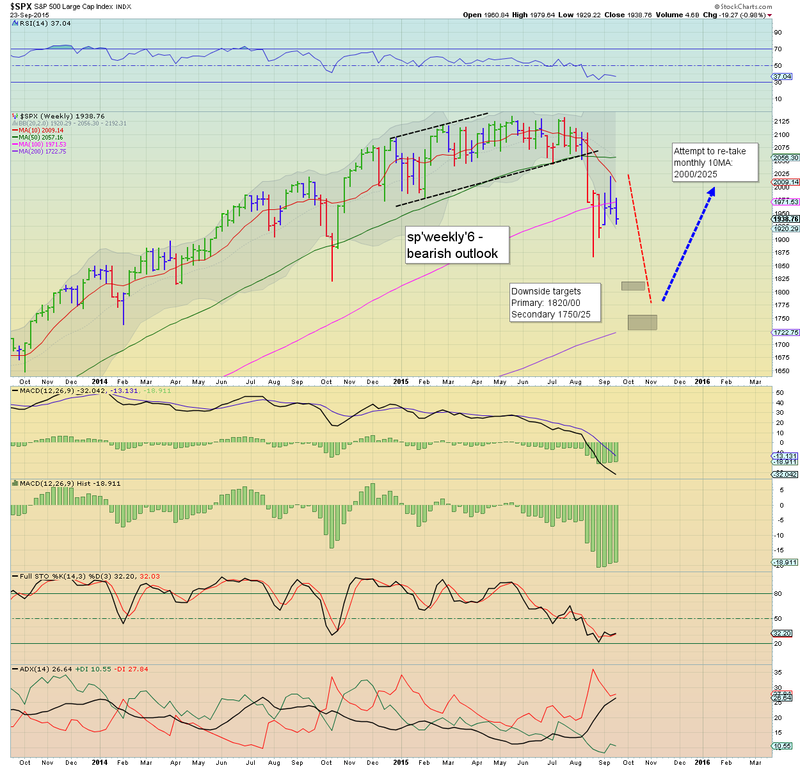 Whether we get a weekly close <1900... difficult to say. 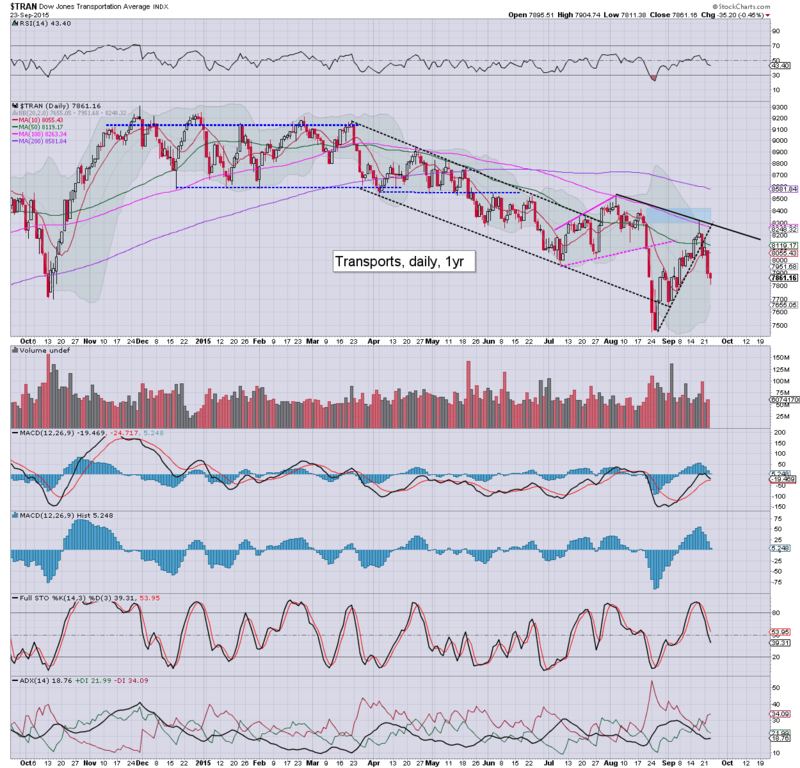 Trans remains utterly broken.. and the sp'500 is grinding lower.. if somewhat slowly. A test of the Aug' lows looks a given, with the bigger weekly/monthly cycles suggestive of sp'1820 within two weeks.